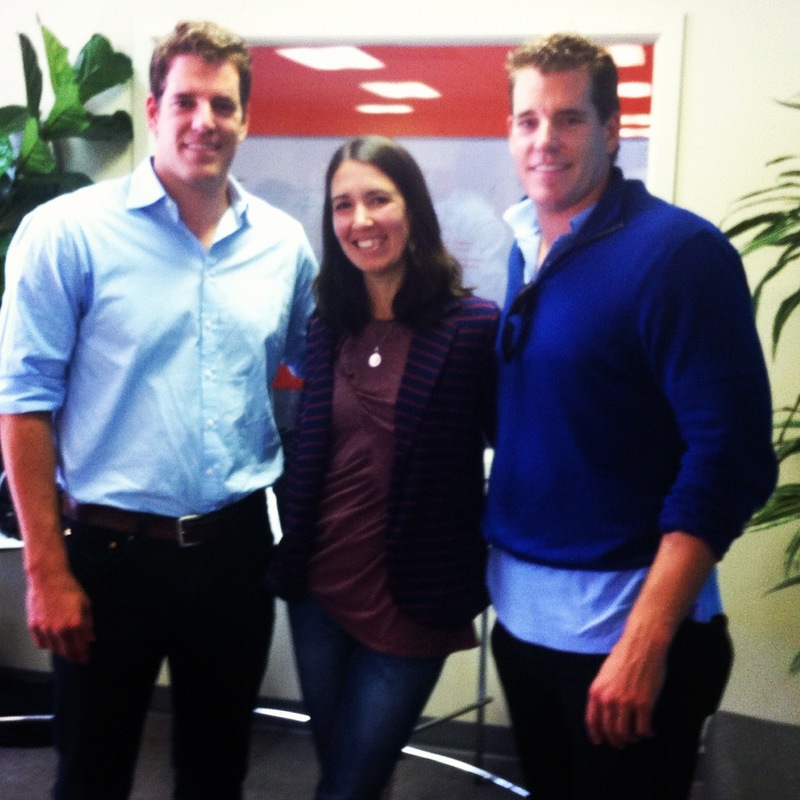 Yesterday, I had the great pleasure to meet the Winklevoss twins, famous for their involvement in the founding of Facebook, and made pop culture icons by the feature film The Social Network. I’m completely delighted by the above photo, and very proud of it, as it took me a little bit of courage to jump up there and ask them to pose with me. They were super gracious about it, and I really enjoyed listening to them speak. In case you are wondering how we met, I am on the mailing list for a wonderful series of events hosted by ZURB, a product design company in Campbell, California. Through their influence I have met and had the enormous good fortune to hear and learn from some of the greatest entreprenuers, startup founders, investors, and otherwise all-around brilliant people from the tech industry in general. It also happens that 90% of the events I have attended have been led by male speakers. In many other ways, the speakers are diverse: race, class, background, ethnicity, education. But, this *is* Silicon Valley. A question was asked about the link between sports and entreprenuership, for example, and Cameron and Tyler Winklevoss spoke with great enthusiasm about the lessons they learned about teamwork, grace under pressure, and ethical behavior from their experience as athletes on the rowing team at Harvard. I became uncomfortable. I just don’t relate to team sports as a metaphor for business. I’m sometimes troubled by the emphasis on competition, agression, and meritocracy that is the startup culture, to some extent. I found myself looking around the room. 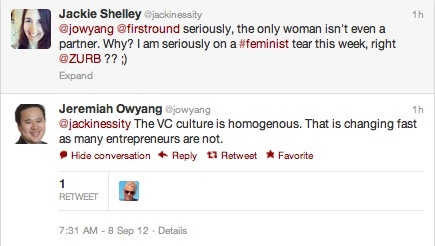 As is usual at ALL the Silicon Valley tech events I attend, I was in the minority as a woman in the audience. The crowd was sprinkled with various skin colors, but leaned decidedly to the light-skinned side. I note the skin color issue for a reason. I recently experienced some financial difficulty, and this led to a conscious decision to go without a car for a time. As a result, I have been riding the VTA Line 68 bus often in the last month to get between the South Bay, Morgan Hill, CA, where I live, and the larger public transportation system in the North and East Bay. I can tell you that every time I ride the bus, without fail, everyone on the bus is a skin-color shade of brown. Or darker. The last time I rode line 68 from San Jose back to Gilroy, in midafternoon, I reflected on this, and watched for an hour as every SINGLE person to get on or off my bus had at least brown hair or darker, and most with skin color brown or darker. I find something very troubling about this line of thought. Clearly our society is still stratified. Things are much better, but we are not where we need to be. Do you see what I mean? Here is a VC firm, presumably with money and influence (though I don’t know that: I’m making assumptions of my own, here 🙂 ) and ALL of the partners are men. Mostly white men. The LONE woman, off to the right? Isn’t even a partner. Don’t TELL me that they couldn’t find any smart, talented, qualified people for this team. Uh-uh. Not buying that one. I know too many brilliant women to buy this argument, anymore. Sorry to pick on you guys, but I can definitely think of other examples. I’m a woman. I also happen to be half hispanic, and though I am light skinned, the rest of my family tribe is decidedly not. I want to believe that we’ll have the same opportunities as others, but sometimes I fear it’s not the case. He’s right. Good ideas come from people of ALL races, ALL backgrounds, and ALL shades of skin. All genders, not even just male and female, but all the shades in between and outside. I think of Amos Mac, @amosmacphotos, a brilliant transgender photographer that I met last year. Silicon Valley, wake up to the value of your diversity. It’s getting better, but we can do better, still. Are you with me? Even some women’s business groups I belong to have male speakers over 50% of the time. I don’t get that AT ALL. Don’t get me wrong, I believe you should have the best speaker available, but many of the topics are general enough that I know there are women speakers out there as capable as any of the men speakers. I didn’t mean to sound complainey, exactly. I guess that photo just touched a nerve, somehow. I noticed it not long ago that many of my role models were men, and am making a conscious effort to think outside of the gender box right now. I’ve spent A LOT of time thinking about this and writing about it. I spend every week on the road and I see this in airports, hotel lobbys, and restaurants. I rarely see a woman in the see of men with priority access to flights. 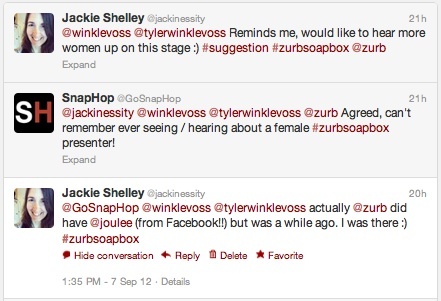 It’s pretty common for me to be the only female speaker at conferences. 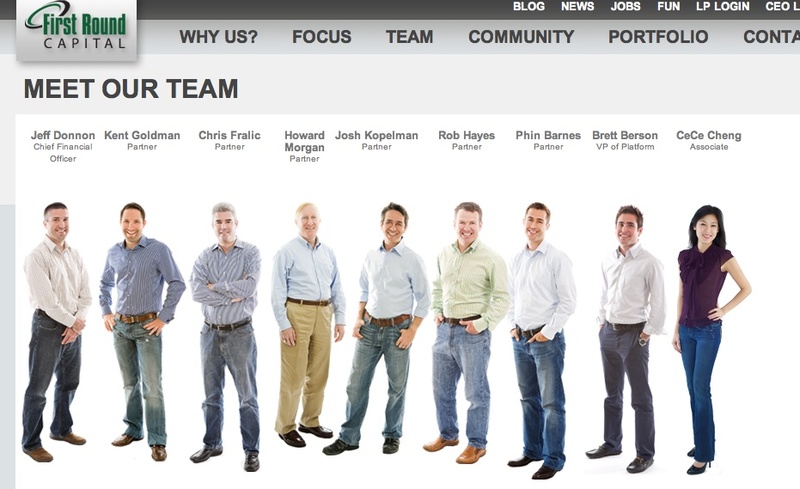 And, with the exception of one, all of our clients are men. I’ve tried to figure out why this is. I don’t have kids so I have flexibility to go on the road. I can attend an emergency meeting in LA tomorrow, if needed (and that’s happened). I can open my calendar to speaking and to travel. But, I can imagine if I had kids, I either wouldn’t have that flexibility or just wouldn’t do it. I think the role of housekeeper, chef, maid, and childcare still falls to women. Men still are seen as the breadwinners so the flexibility falls to them while we figure out how to juggle everything else. We are great multi-taskers and men are better at being completely focused. So I don’t know if it’s that or if the world just hasn’t caught up with all the great things women are doing. Maybe it’s both. I like the way you think and I love that you speak your mind. It’s important to point out these issues because no, we are not where we need to be, not at all and some people don’t even seem to notice.